It was this time last school year that I joined the BVP team for a year-long residency. Before the year was over I would get to spend time at both Middle School 1 and Elementary School 2. The year included coaching new teachers, soaking up what school culture looks like and sounds like at both campuses, visiting high-performing schools across the country, hiring an amazing team and ultimately, building relationships with the most amazing families and scholars that would soon become the founding class of Middle School 2. It was an incredible year. And now here we are! 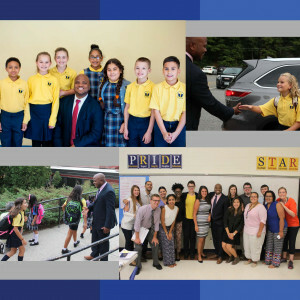 The first week of our first year is coming to a close and I am…..
Thankful: I am thankful for the staff, scholars and families that have made our school a team and a family. In just one week we have built a community that is full of #BVPPRIDE and #OneTeam for MS2 or as we know it – #MSDos. Amped: I’m not excited. I am amped for the work ahead. We have a saying around BVP -“the reward for hard work is more hard work.” We also know how to have a lot of fun while we work hard. That was already evident this week as 83 5th graders and their teachers could be seen getting to know each other through our small groups (called squads) or teachers helping scholars get familiar with middle school lockers and class transitions. Exhausted: Working hard is also pretty exhausting. I for one am looking forward to a little bit of extra rest at Cape Cod during the Labor Day weekend before we start our first full schedule week. Ready: I’m ready for the marvelous surprises that await us! It’s true, the team is well planned and the curriculum is tight, but so much of becoming a school is in the process of becoming. We have daily stepbacks and ask ourselves, “How can we be better tomorrow for our families?” From tweaking systems and routines to managing arrival and dismissal, we do it all with a smile! The founding staff members have been flexible, reflective, and open. So stay tuned and be on the lookout for more news from the newest school in the BVP family. To read more about the opening of #MSDos you can read this article published earlier this week in The Pawtucket Times.